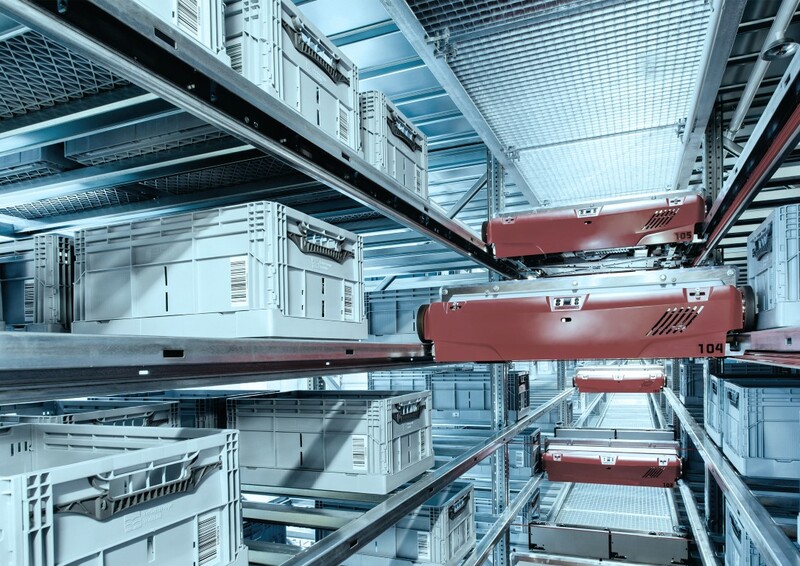 Key module in highly dynamic automated storage and retrieval systems. Shuttle systems or ‘shuttle robots’ automatically store and retrieve cases, totes or trays in a 1-deep or 2-deep storage buffer. Highly dynamic shuttle systems are typically used for consolidation buffers where sequencing of unit loads is required, or alternatively for automatic storage and retrieval of stock totes for Goods to Man picking concepts. At Inther, we offer industry-wide insights in the pros and cons of the various shuttle systems available on the market today e.g. single vs. double-deep storage, roaming vs. one dedicated shuttle per aisle, and carton vs. tote handling possibilities. Our concept design and evaluation is supported by fact-based analysis of customer data. The shuttle-system building block can be implemented as an individual compact system or as a component of an integrated logistics system. At Inther, we have extensive experience in providing the controls for shuttle solutions. Use of the Inther LC software suite opens up the availability of additional functionalities such as customized sorting and sequencing in the case of priority orders.